How has your week been going so far? Gotten those work outs in? Stuck to your diet plan? Even if you haven’t, don’t beat yourself up about it but pick up and start NOW! 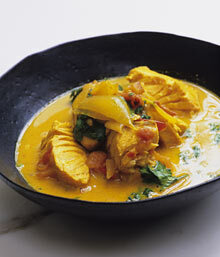 You can do it by making my delicious salmon curry I’ve given you the recipe for below. Salmon is one of those super foods that gives you those good omega-3 fatty acids, but be mindful to select WILD salmon – and not farm raised salmon – otherwise all those delicious nutrients most likely won’t be there. Omega 3 fatty acids are beneficial not just to provide you the right kind of fat in your diet, but can also prevent blood clots, heart attacks and lowers cholesterol and the total amount of fat in the blood. While salmon is fattier than most other fish, it’s the kind of fat you want and therefore should be included in your diet (provided you like fish -otherwise make sure you get those fish oil capsules in daily!). Omega 3s can also relieve arthritis pain, which is good for me since I’ve developed some arthritis in my knees after multiple surgeries. Today I did arms at the gym – I’ve started giving arms their special day because I want to bring up my biceps and triceps more. I’m supersetting biceps with a tricep exercise and go back and forth with no rest, and I get an insane pump from this. I typically do 4-5 sets of each and go to failure (reps) and today I did about 8 exercises. I’m already getting stronger and I can see those babies under all the excess fat, which is now starting to slowly come off. All in due time – but eating my salmon and getting those omega 3 fatty acids in will help me burn fat, as they are known to help in that area as well. Try this for dinner and spice up your fish – as always, I appreciate feedback and any questions or comments you have about recipes, diet, training or just need a dose of motivation and inspiration! Add a bit of sunflower oil (or other vegetable oil) in a large saute pan over medium heat, add the salmon and saute for about a minute on each side and remove from pan, and set aside. Add red onion and scallions and saute until soft. Add the curry paste, coconut milk, and soy sauce and let it simmer for a couple of minutes until nice and fragrant. Add the chili and the lime and cook for another 5 minutes. Add the salmon back into the pan, cook for about 1 minute, then add the peas and cook another minute and you’re all done. Garnish with cilantro and serve. Make sure the salmon doesn’t over cook – fish cooks fast and you want it to be nice and juicy!